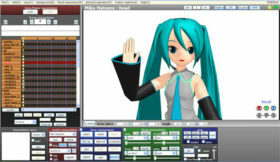 LearnMMD.com always has the latest version of MikuMikuDance ready for you to download. We check the VPVP homepage regularly to ensure we are providing you with the latest version of MMD. Go to the Downloads page to download the latest version of MikuMikuDance… and then visit our Step-by-Step instructions page that will show you how to get started with MMD! If you have a problem opening MikuMikuDance, you will find the answers you need on our Troubleshooting page. MikuMikuDance only runs on a Windows PC computer… it requires that you have a mouse and a strong graphics card. MMD is a DirectX “game” and requires that PC environment. It will not run on a tablet or a phone.